Click photo to enlarge. Code no BT937DS. Reproduced by kind permission of Mrs Dorothy Smith. Few places in the valley have undergone a bigger change than Birks Field, St Peter's Gate, Walsden, pictured just months before World War One broke out. The view today is virtually unrecognisable, only St Peter's Vicarage, top centre, providing a clue as to where the scene is set. 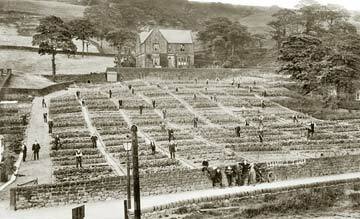 By 1918 over 26 acres of land in Todmorden had been let to 1,170 allotment holders; as a result the town fared better than most places when food was in short supply. But even here potatoes were unobtainable in the spring of 1917. Swedes were grown instead!